Swedish actor Ida Engvoll is on a roll, having appeared in hit series The Bridge, The Restaurant and Bonus Family. As UK streaming service Walter Presents premieres her crime thriller Rebecka Martinsson, the star talks about avoiding typecasting and working with mosquitos. If you follow Swedish drama, there’s a fair chance you will have come across Ida Engvoll. The actor has steadily built her career on appearances in some of the country’s biggest series that, thanks to the global interest in Scandinavian fiction, mean she has been on screen around the world. Roles in Beck, Arne Dahl and Fjällbackamorden (The Fjällbacka Murders) charted her early life on television before she took roles in pan-European crime drama The Team and the third season of Broen (The Bridge). Engvoll has become much more recognisable, however, since starring in 2015 award-winning feature En man som heter Ove (A Man Called Ove). More recently, she has starred in TV4 crime thriller Rebecka Martinsson, period drama Vår tid är nu (The Restaurant) and comedy-drama Bonusfamiljen (Bonus Family), both of which have been renewed for third seasons by SVT. It’s her versatility that makes her screen credits stand out, switching between genres with ease – a trend that isn’t entirely accidental. “I always look for good parts and projects that are attractive but we have a lot of crime series in Sweden,” the actor explains. “It’s not easy to avoid doing crime series but it’s always about the character and the genre and the director as well. I try to not get stuck [in one show]. Engvoll is speaking to DQ ahead of the UK launch of Rebecka Martinsson, which has been picked up by Channel 4-owned streaming service Walter Presents. The first episode will debut on More4 this Friday before the box-set becomes available online. The eight-part series, produced by Yellow Bird and distributed by Banijay Rights, is based on the novels by Åsa Larsson, telling four stories each set over two episodes. The first instalment sees high-flying lawyer Martinsson (Engvoll) return to her hometown of Kiruna, in the northern most part of Sweden within the Arctic Circle, following news of her friend’s death. But when what appears to have been an accident turns out to be murder, she becomes embroiled in the investigation while also facing up to the terrible trauma that forced her to leave her childhood home behind. The actor describes Martinsson as a character of many faces, but one who is very much grounded in reality. Viewers may recognise Kiruna, the show’s Arctic setting, from 2016’s French-Swedish coproduction Midnight Sun, which saw a French cop head north to investigate the murder of a French politician. During the summer months, there is near 24-hour sunlight, a scenario of which that show took advantage to heighten its fish-out-of-water premise. The midnight sun is also present in Rebecka Martinsson, though it serves simply as the background of the story rather than a driver of it. In any case, the environment proved no less challenging to film in. “There are many challenges working there – there’s no food and lots of mosquitos and you can’t really go everywhere by car,” Ingvoll says. “But it’s also very nice being there. That’s one of the reasons why I want to do a second season because I want to spend as much time there as possible. It kind of feels homely, even though I haven’t spent much time there. I really like it. Something happens to your body – it’s the midnight sun. Those long days never end and the sun never sets. I was really in love with the landscape. With all four Rebecka Martinsson novels adapted in the first season, the character would have to appear in some original stories should the series return for a second run. Until then, Ingvoll is keeping busy with turns in hit series The Restaurant and Bonus Family. Crime series remain a staple of television in Sweden, across Europe and around the world. 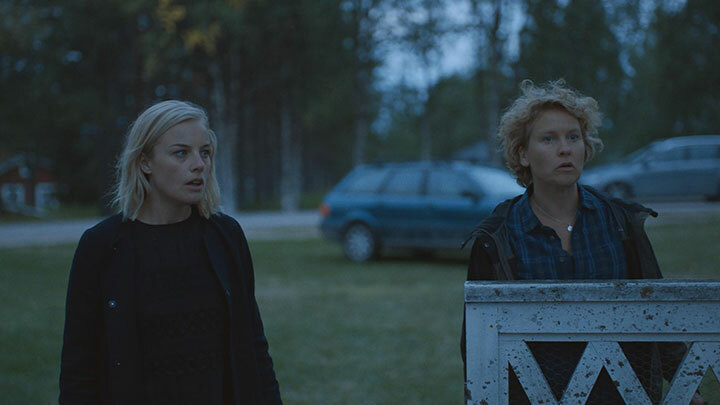 It means producers and broadcasters are continually trying to find ways to invigorate the genre and keep up with the demand, particularly in Scandinavia where the Nordic noir boom has seen global audiences drawn to its gripping plots and dark and moody landscapes. That many series coming out of the region are backed by European funding presents a problem for Ingvoll. “We could never produce the amount of series that we do without the financial support from Germany or other European countries, but with that money also comes demands,” she notes. “The Germans want 90-minute films and this country wants 10 one-hour-episode seasons. There are so many layers, even when you haven’t really written the dialogue yet, the setting has already a shaped so it’s quite hard. There’s less room for the genius of writing or storytelling. Ingvoll first became aware of the Nordic noir trend when she starred in 2015’s The Team, cast alongside Lars Mikkelsen, Jasmin Great and Veerle Baetens in the story of a team of police officers brought together across Europe to solve a series of cross-border murders. “I realised on that show that we had a genre [in Scandinavia] that was so specific. My co-stars from Germany and Belgium were asking, ‘How do you do this genre?’ We were like, we don’t do the genre, it’s just a show. That’s when I realised we had created a style, a way of doing things.